Brazile: "I'm begging friends to adopt families." (CNN) -- Shortly after Donna Brazile made an emotional appeal on CNN Monday for rescuers to find her sister in New Orleans, an official with the Louisiana Fish and Wildlife Service sent a boat to the location she described on air and found Brazile's 46-year-old sister and five others alive. Brazile, a CNN political contributor and the former manager of the 2000 Gore-Lieberman campaign, spoke to CNN by phone shortly after the rescue. She said she is convinced her sister, Sheila, most likely would have died if she had not made her plea on CNN earlier in the day. Brazile appeared on Wolf Blitzer's "The Situation Room" shortly before 5 p.m., saying her sister's last known location was in an assisted living shelter at a New Orleans YWCA. She gave the address of the facility as 3933 Tulane Avenue. "I want to find Sheila. I want to hear her say, 'Hey, Boo!' 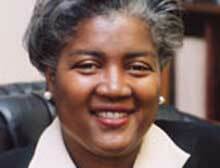 I want to hear from my sister," Brazile said. "Wolf, I can't tell you the logistical nightmare of not just trying to find people, but then, of course, once you find them, to get them into shelters and then also to make sure that they have some places to go." She added, "I'm begging friends to help adopt families." Her sister was in the assisted living shelter because brain surgery several years ago had "made her unable to take care of herself," she said. Brazile, a New Orleans native and one of nine children, said her 75-year-old father and four of her siblings had decided to weather out the storm -- a decision they came to regret. All have now been rescued. "As my father said to me just last night, that at nighttime, you can hear people crying, 'Help me. Help me.' And he said the sound at night of hearing people crying for help and you can't help people. He said it's just heartbreaking."